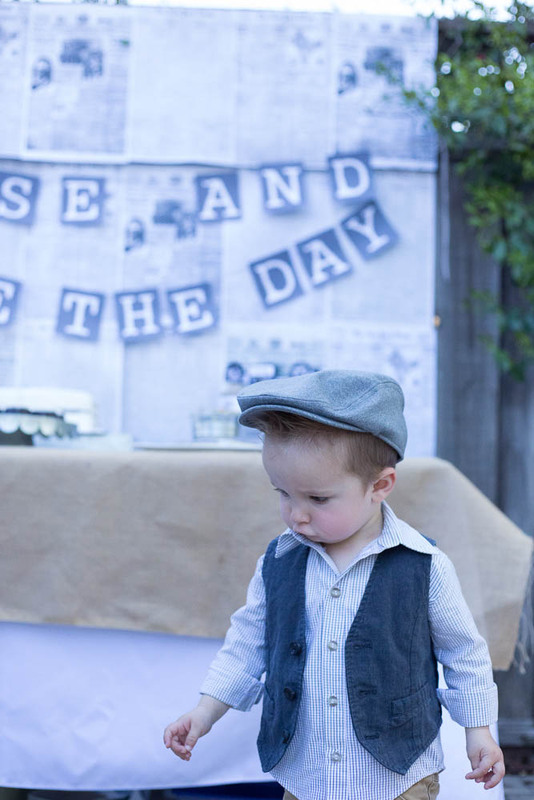 I absolutely LOVED planning this Newsies themed party. The 90’s Disney movie was my favorite movie growing up (still in my top 5), and my friend Megan and I would watch it every single sleepover we had-and had it memorized! I also was lucky enough to see the Broadway version when it was on tour and loved it almost as much as the movie! (my girls are obsessed as well. #parentingwin) The movie will always be super nostalgic for me. LOVE the songs, choreography, oh, and probably had crushes on most of the newsies, including Jack Kelly-not who my Jack is named after, but a happy coincidence for sure. Also, with the Lumber-JACK party and this one, how many parties do you think I can throw him that kinda go with his name? lol! 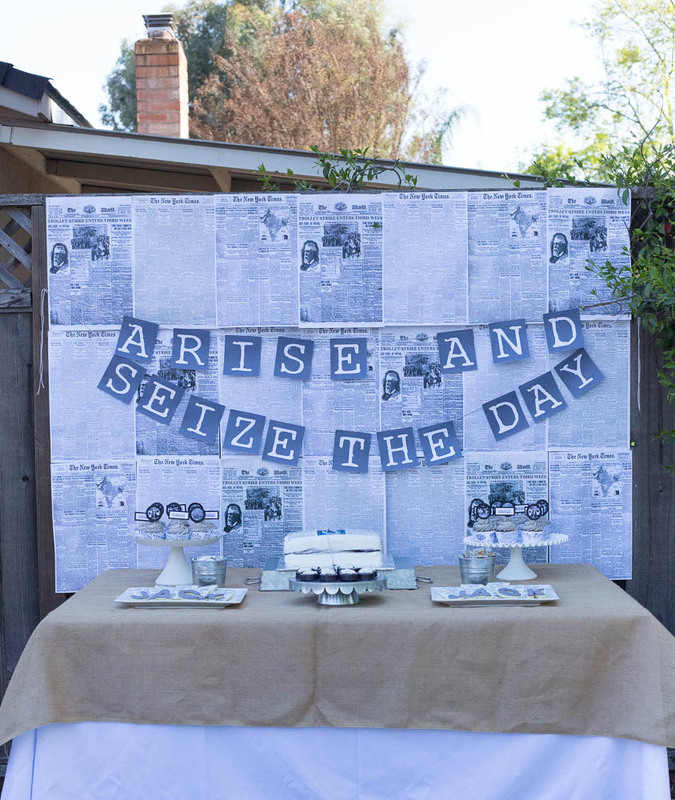 Anyway, as you can imagine there are not a ton of Newsies parties out there so I got creative and at the same time it was pretty simple! Let’s dive in! 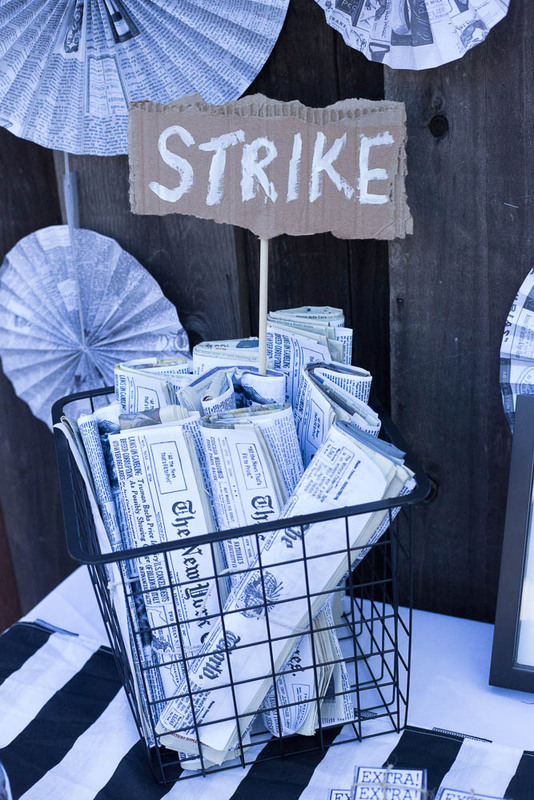 Now onto some of the decor-I hit the black and white theme pretty hard, with these newspaper fans, and some strike signs I made for the centerpieces. I also rolled some donated newspapers up, with an old New York Times front page I found online, and also the front page they used in the Broadway version! Tied them with some twine and loaded them in a metal basket. 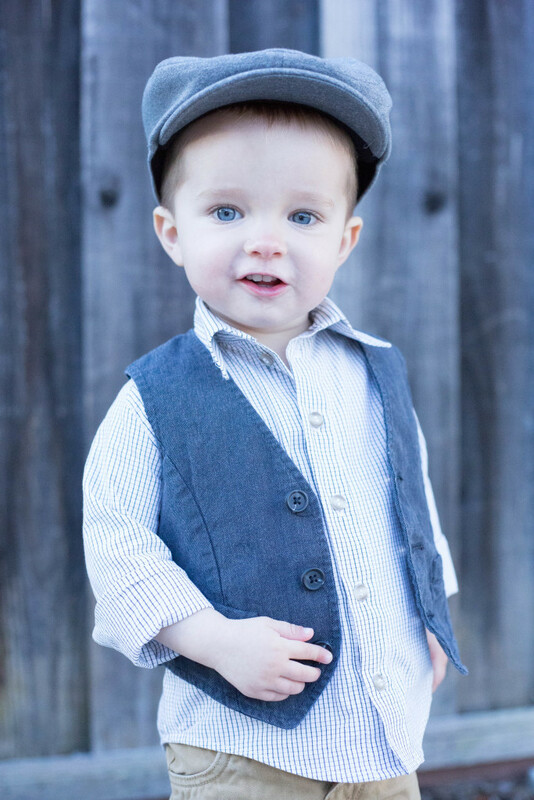 I also added an old picture of Jack we have framed in our home, because he was wearing a cute lil Newsies outfit! 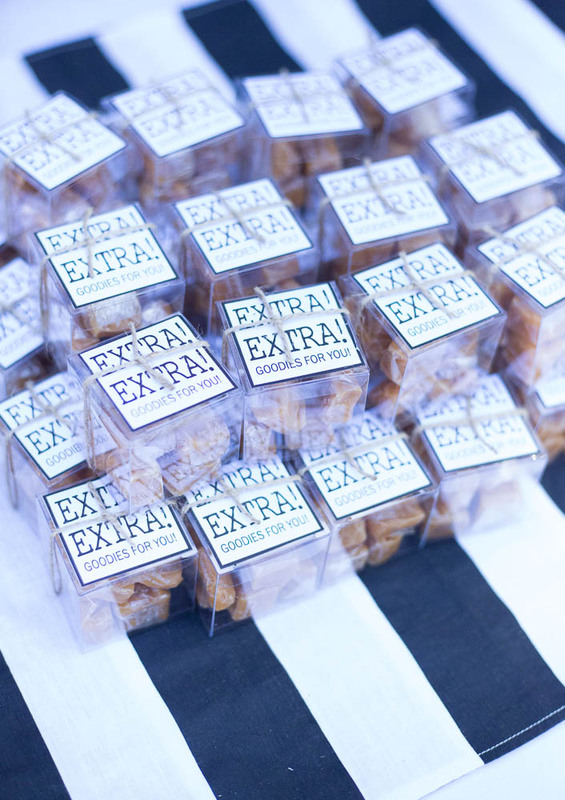 LOVE the favors-I bought these clear boxes and loaded them up with these delish caramels! Made a cute label and printed it out on sticker paper, cut them out, slapped them on, then tied some more twine around the whole thing! 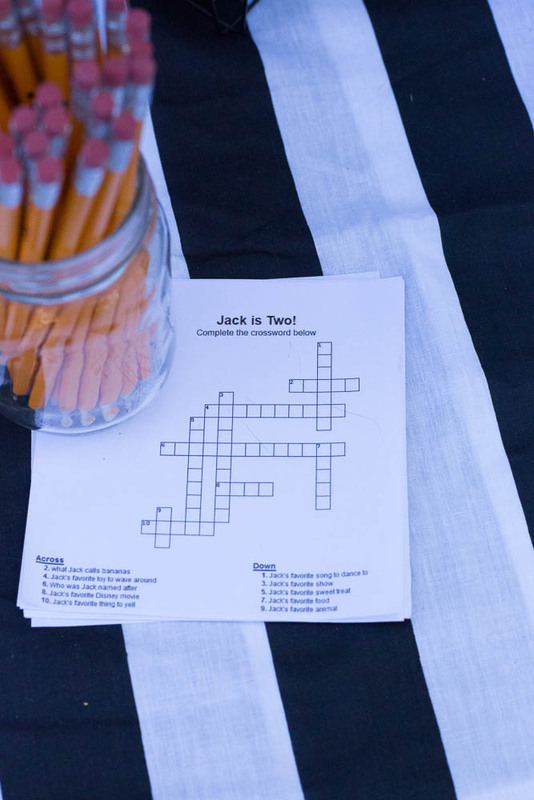 I also made a crossword puzzle about Jack for people to try and solve! 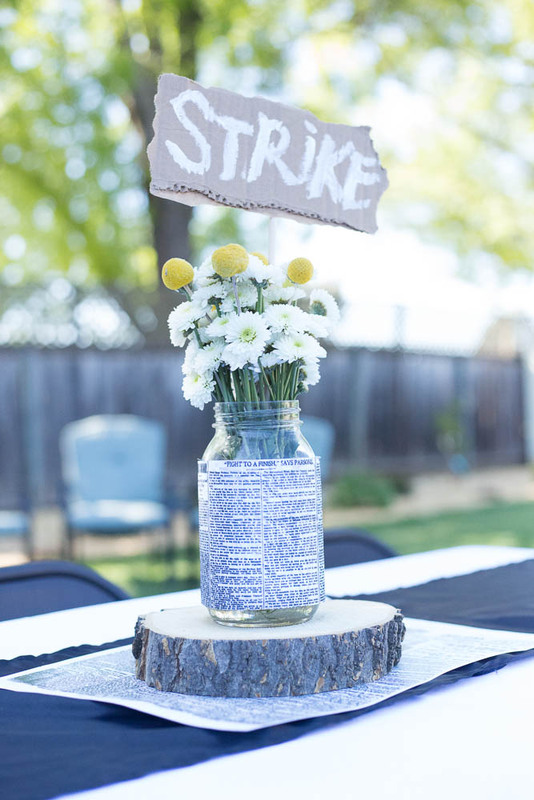 I love how the table turned out! Very simple and monochromatic, but fun! 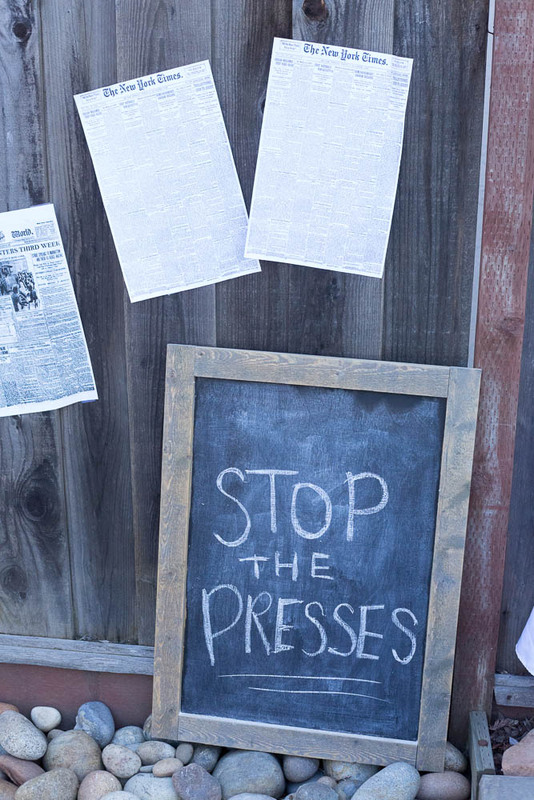 I printed a bunch of those newspapers I mentioned earlier at Staples (the 11×17 size), and wallpapered my fence with them! 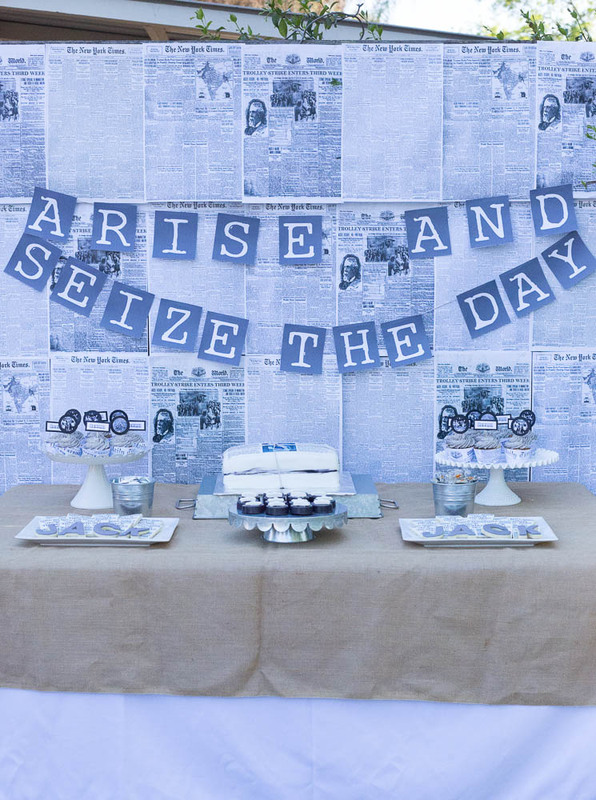 Then I added a banner I had made (I carried the banner out to the party HAHAHAA ha. ha. sorry), and a white tablecloth and burlap cloth layered on top. The cookies were oh so simple, I felt like I cheated at this party! lol! 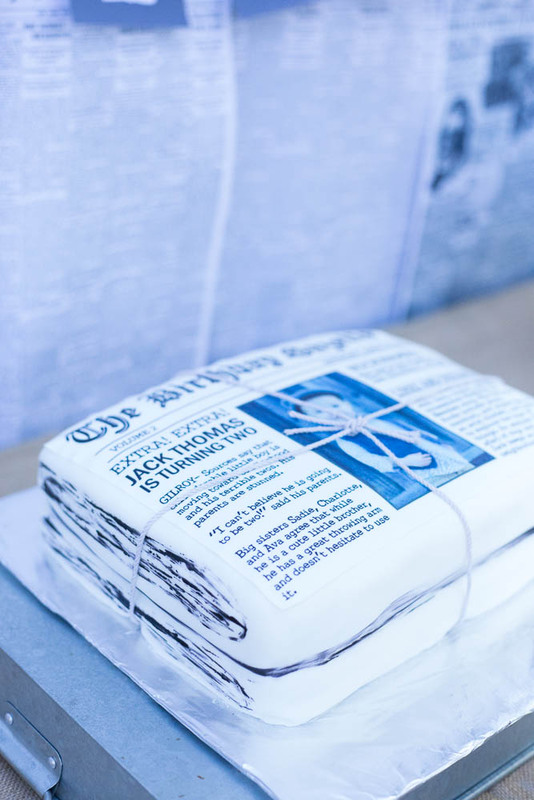 After a bit of research, I ended up purchasing printable icing sheets from this website. (not sponsored, just liked the site!) I designed them myself and loaded them to the site-was very easy to navigate and use and the quality was great! So was the price. 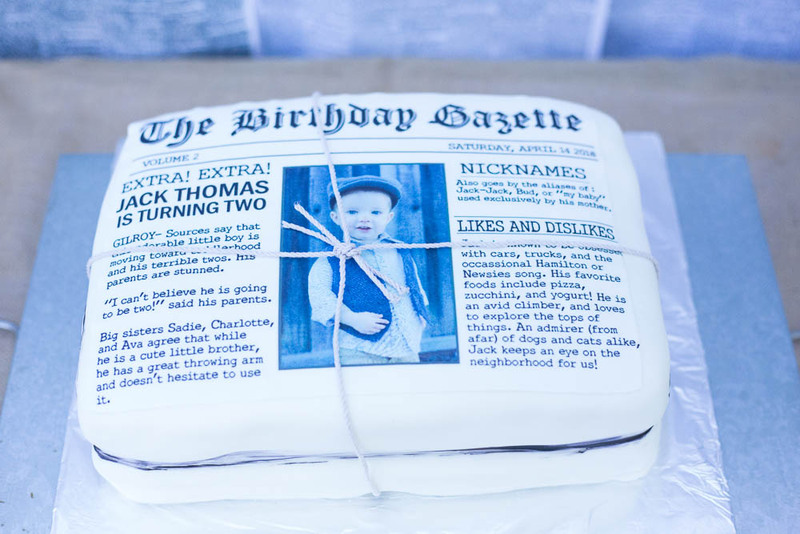 I ordered two sheets of the cookies, and one for the cake, which you’ll see below. 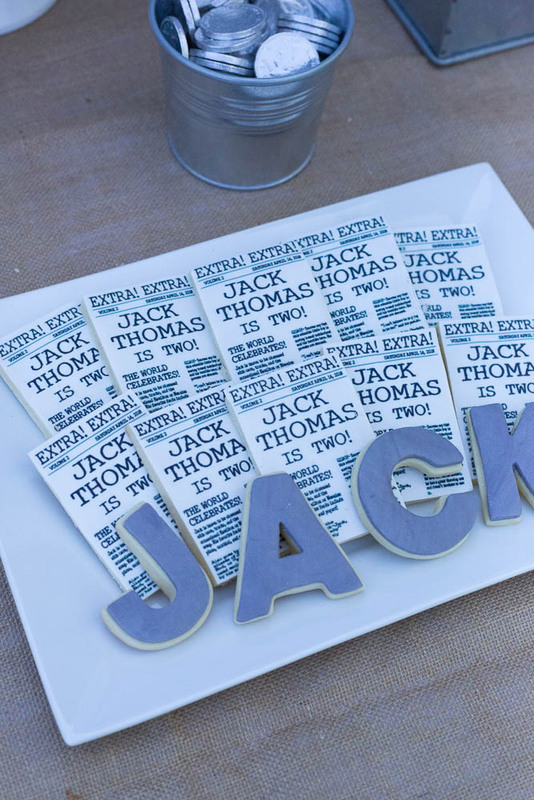 For Jack’s name cookies, I used some grey fondant, and the same cookie cutters I used for the cookies to cut it out. SUPER easy! 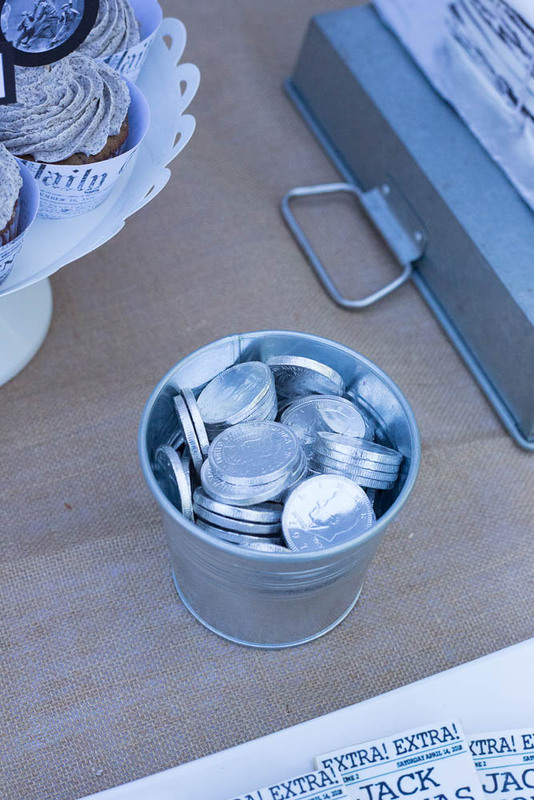 I bought some silver chocolate coins to be “two bits”. Why am I the way that I am? 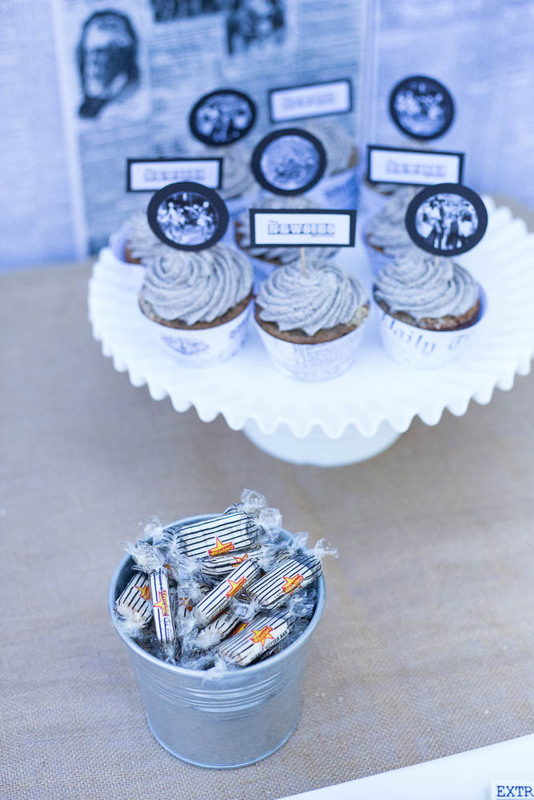 For the cupcakes, I made some cupcake toppers with some black and white photos from the movie and the logo from the broadway show. 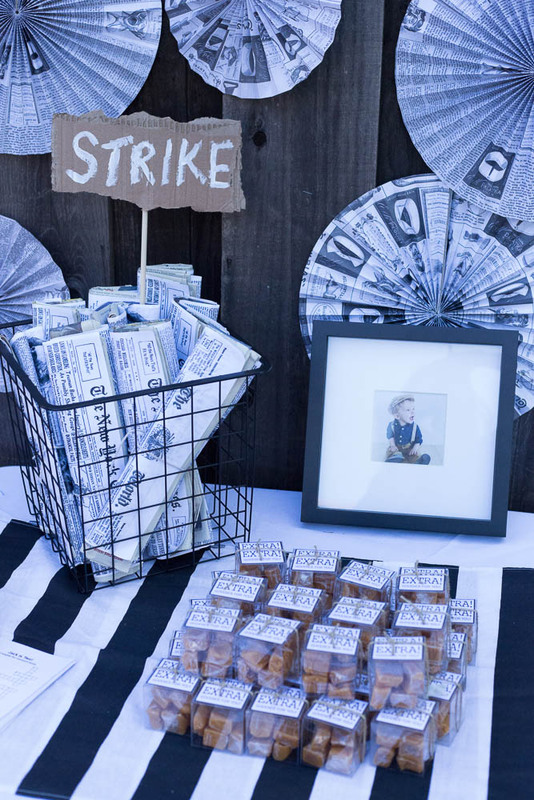 I also made the newspaper wrappers and LOVE how those turned out! I made oreo cupcakes with oreo frosting-yum! I had to hit the black and white theme at every corner, lol. Here’s the cake! It was really very simple compared to others I have done, but still cute I think! 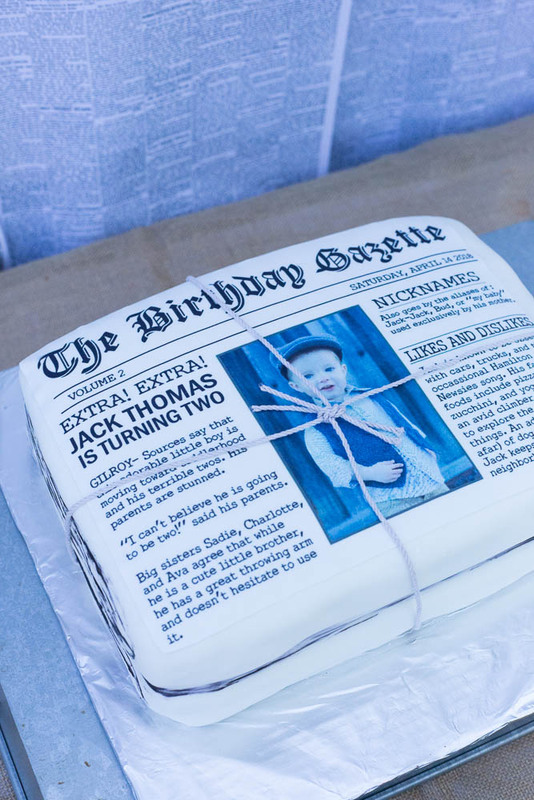 I made a couple of 9×13 cakes and layered them, frosted them, and covered them with fondant. Then I added the printed icing sheet on top, just with a little bit of water. Even though you can see the edges of the sheet, I think from a distance it looks pretty good, right? 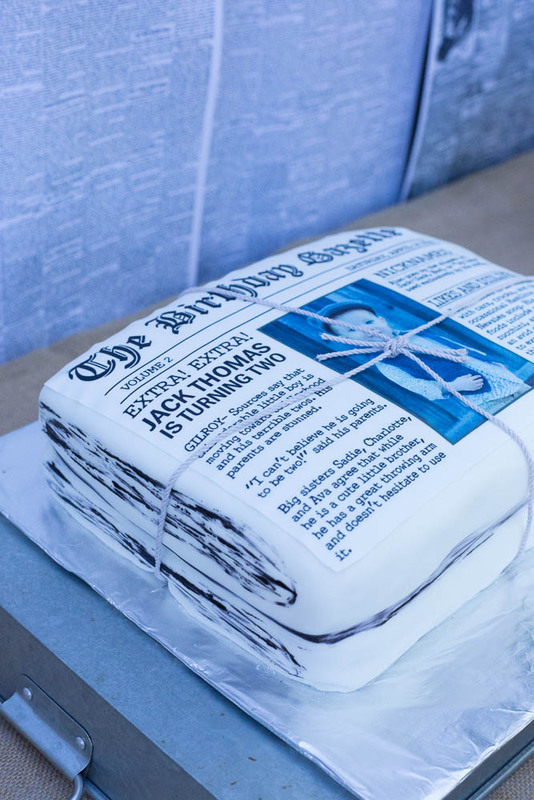 I then used a little food dye to create some separation between the two “newspapers”, and also the folds on the side. Added some twine and was done! 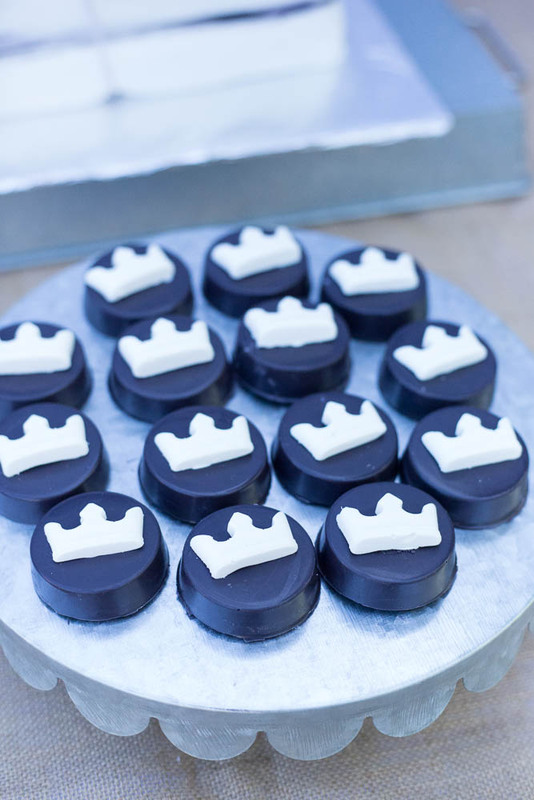 I have been doing these chocolate covered oreos with this mold for quite a few parties now, (this one and this one are some of my faves) and I love them! 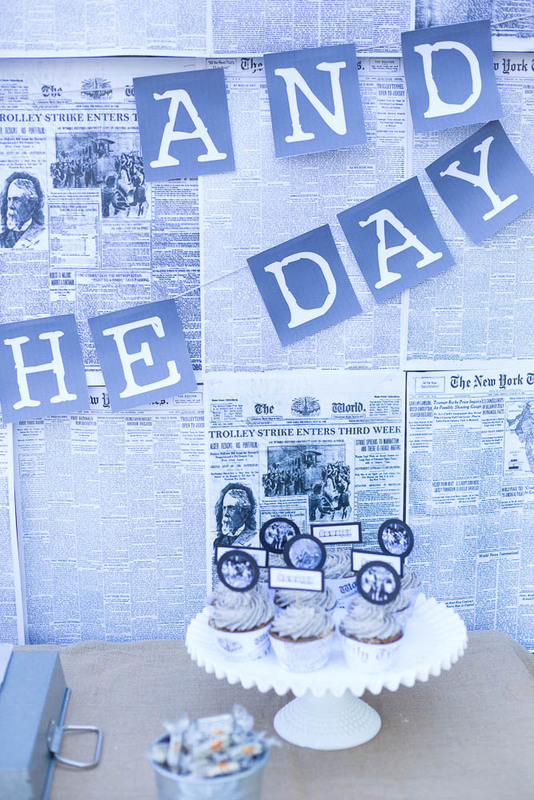 I made these King of New York style-and they are so cute! Used this mold for the crown. I bought some old fashioned peanut butter candies and they fit the theme perfectly! 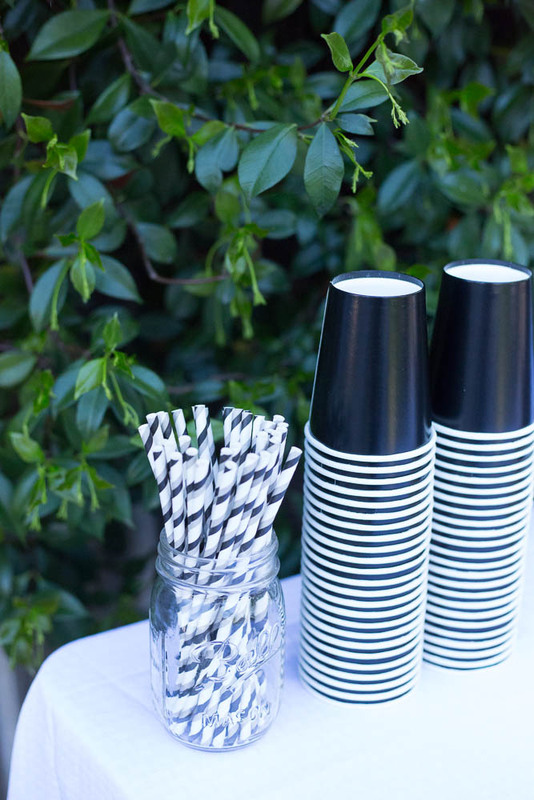 Grabbed some black paper cups and striped straws, LOVE. 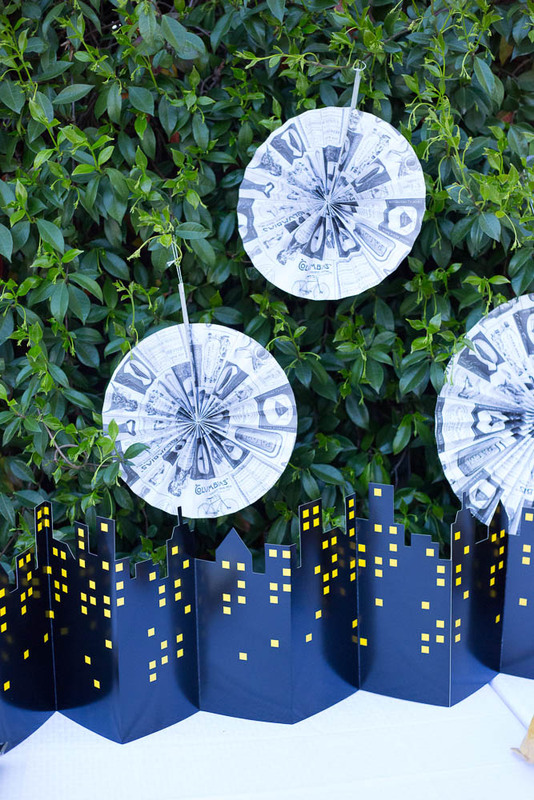 I bought this city backdrop at the Target dollar section years ago for a superhero party that got scrapped, but it worked for this theme too! 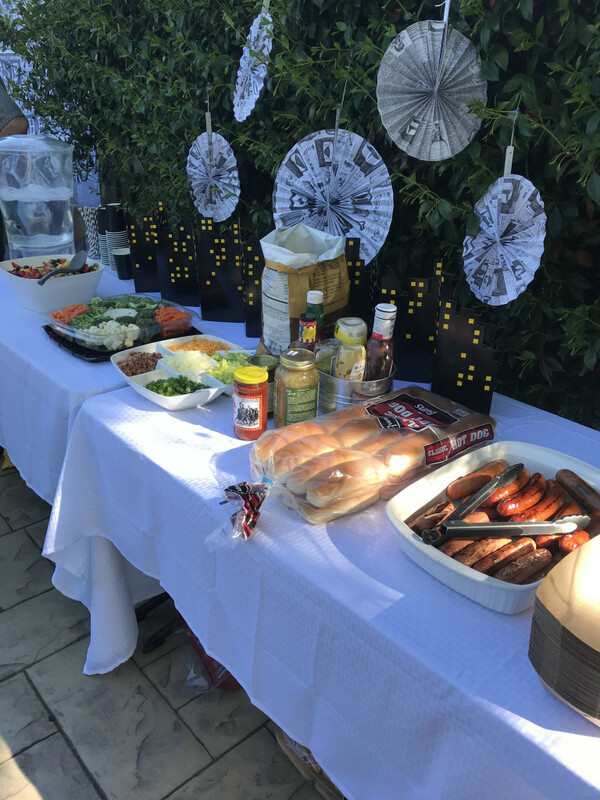 For food, we had a hot dog bar with all the fixins! We had several types of hot dogs and sausages, and then TONS of toppings! Also some veggies, fruit salad, and chips. So yum! Love this little boy of ours! He is such a sweetheart! You are amazing with your creativity! Love all of this! As soon as I saw the theme I was hoping to see pics of Jack in a hat like that. Thanks for not disappointing me! Fantastic party. 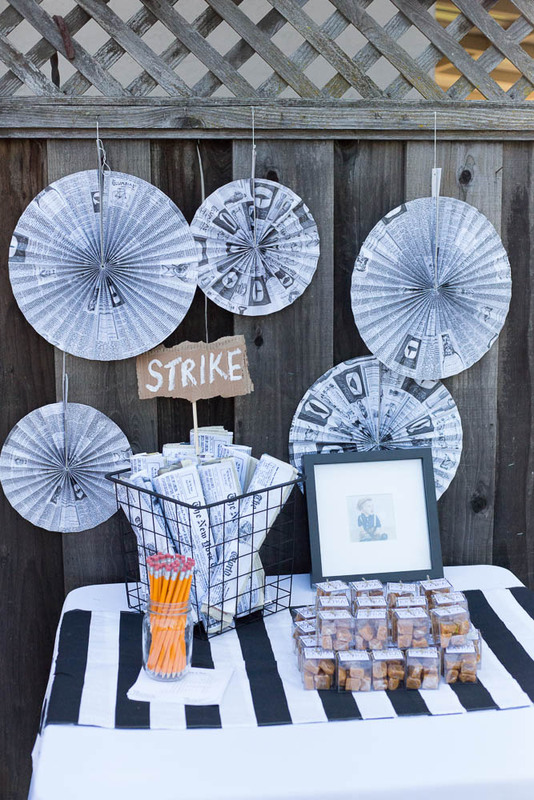 I’m so glad I’m not the only one who carries the party theme from the invite to the décor and food. for sure! I like to theme it all the way through! 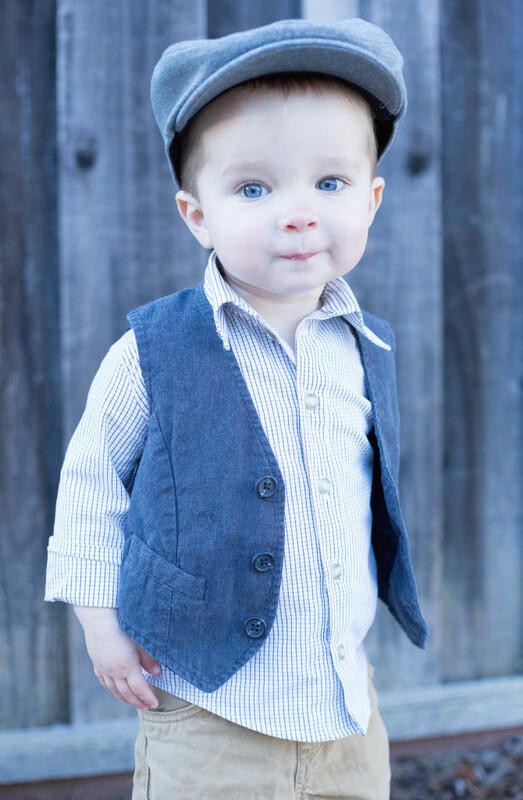 I love a little boy in a hat, right?! OMG, Jack is absolutely adorable!! Totally fits the part to a T!!! And your parties are always exquisite! You have such a gift. One of these days I’m going to have enough time and $ to throw a fun one like this. Thanks for sharing and all of the fun inspiration!! Keep throwing them and please keep sharing!! Hi! 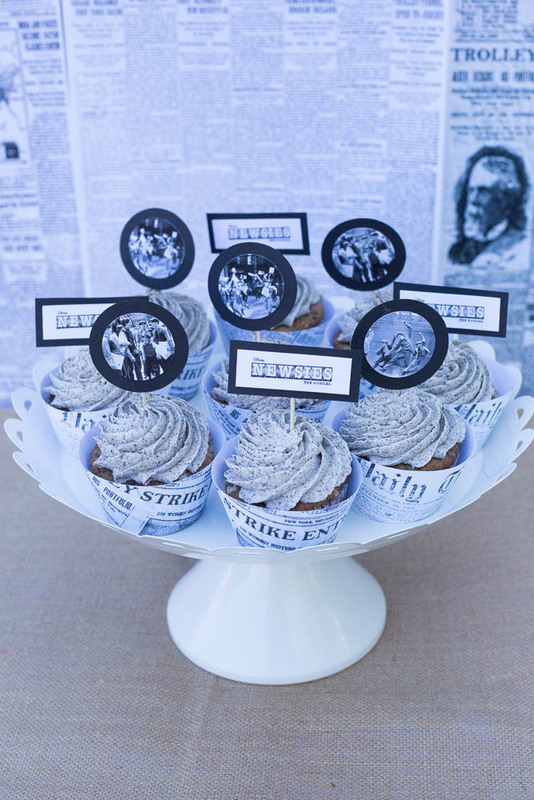 Do you have a recipe you used for the Newsies Cupcakes? 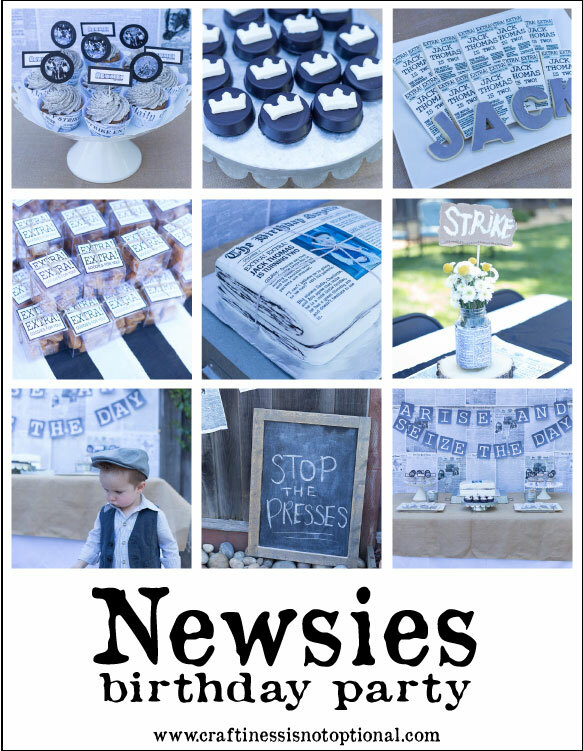 My daughter is in a Newsies show now and I was wanting to make some for the cast party. Love your ideas, thanks! I can’t find the recipe, sorry! there are many good ones on Pinterest!